Today I have a bit of a...Throwback Sunday photo for you. Okay, okay, I couldn't wait till Thursday! Anyway, here is a totally adorable photo of three snails I used to have, Clint, Eastwood, and Little Ben. This photo was taken in June, I think. I got these fellas in May when we were visiting family in Florida. You might have been a reader back then, and you probably enjoyed our "Florida Vacay" series! Clint's the biggest one, Eastwood is the medium sized one, and Benny is the tiny one clinging onto Eastwood, yet still tucked in his shell. He was the shy one! Anyway, I sent this photo in to Cute Overload, a super duper well known blog that "scours the web for cute imagery". The world literally freaked out in January when they made their last post, but let's get back on track! They featured the photo, and titled it "All Aboard...Punks!" and though I don't really get the "punks" part of it, I'm still glad they featured my slimer babies though! 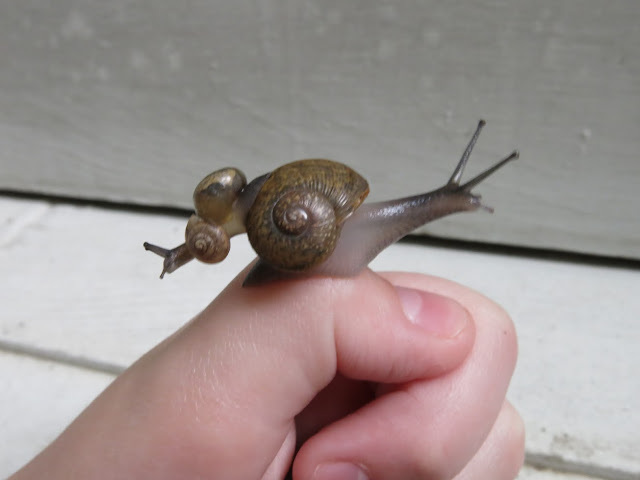 I hope you like this photo, for I think it's really cool and it's a great way to remember my first trio of snails, especially Clint, who sparked my passion for snails! Have you ever watched "Minuscule?" It's a series about the little bugs and snails that live in the French country side. You can find it on youtube. You would probably enjoy it. That sounds really cool! I'll be sure to check that out later. Thanks, Chester! Eastwood and Little Ben were a little lazy sometimes! That is some pawsome hitchhiking.